A camping trip can be an enjoyable experience if you pack the correct camping and survival gear. But with the wilderness offering next to nothing, some campers tend to bring either too much or too little, and don’t end up happy at all. So what camping and survival gear should campers bring along? 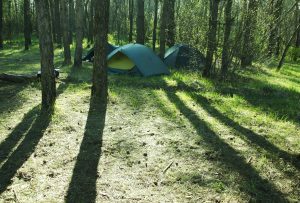 Camping and survival gear should not be limited to sleeping and eating materials – and should not include the contents of one’s entire kitchen and bathroom either. Gear can be divided into 9 main categories: tents, tools, lighting, clothes, first aid, communication, toiletries, food, survival bow, and references and guides. All camping and survival gear will be for nothing if the campers have nowhere to sleep in. Bring a tent, along with industrial strength stakes, ropes, and poles. Also, carry emergency tarp to go with the tent, as well as a tent carpet to keep the floor of your tent clean and comfortable. Don’t forget to carry sleeping bags. Life in the wilderness can be cold and harsh, so choose sleeping bags lined with warm fleece, and blankets made of wool. Moreover, if luggage space fails you, you can always stow your camping and survival gear in your sleeping bags. 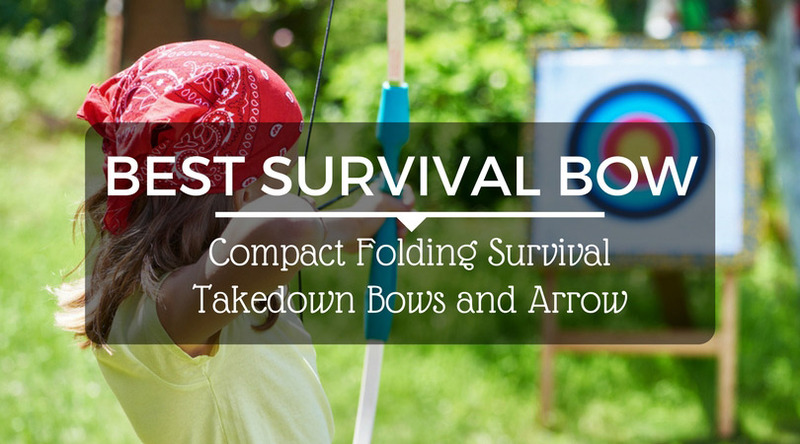 Tools are what will keep camping and survival gear intact through a trip. 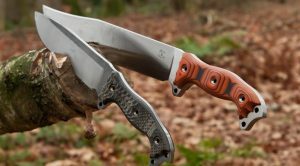 These include screwdrivers, a hammer, a camping knife, a Swiss Army knife or any other folding multi-purpose tool, a long handle pickaxe, a small shovel, a camping saw, scissors, batteries, car maintenance equipment, and a fire extinguisher. Keep these in a handy toolbox out of reach of young children. If you must hike, keep the smaller camping and survival gear in a utility vest with a good number of small pockets. You will never know when you’ll need them. If you will be camping for a week or more, pack the following with your camping and survival gear, and stow them in your tool box: knot tying card, nylon repair tape, spare lantern generator, extra rope, seam sealers, tent leak sealers, and emergency flares. One of the most essential camping and survival gear is lighting. Keep a flashlight handy, along with extra batteries. Pack up matches and a lighter for the campfire, or for torches, if the flashlight fails. Bring along battery operated camping lighters. They are not as bright as gas lanterns, but they are safer, especially if you have to bring children with you. If you must use gas lanterns, safely pack fuel and a funnel along with your camping and survival gear. Use the funnel to add gas to the lantern when you run out, in order to keep fuel from leaking – and fires from starting. If mosquitoes abound in your campsite, don’t forget to bring citronella candles to light at night and keep the pests at bay. Clothes might not sound like camping and survival gear, but with the weather playing tricks on campers, your only layer of protection may be the shirt on your back. That said, don’t forget to bring raincoats and thick waterproof jackets. Nothing in camping and survival gear can substitute for a real first aid kid. Pack up a sewing kit, prescription medications, anti-allergy medicines, gauze, plaster, soap, wound ointment, and burn ointment in a small, easy to find box. Don’t forget to note the address and location of the nearest hospital, just in case you have to run there in emergencies a simple first aid kit will not be able to handle. Complete camping and survival gear should include communication equipment. Although there might not be a signal where you’ll be camping, bring a fully charged cellular phone. You can also take along walkie-talkies, or a battery powered radio. 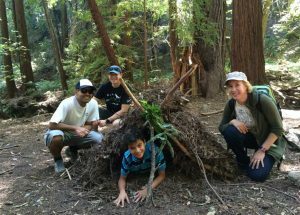 Although usually not necessary for most campers, camping and survival gear must include toiletries, or at least the basics. Pack along soap, shampoo, and a metal mirror for shaving. What camping trip would be complete without food? Pack as much as you can carry, but nothing that will spoil. You can take muffins, hotdogs and marshmallows for roasting, a loaf of bread, and ham. Don’t forget to bring drinks and ice. Store everything in aluminum lunchboxes or coolers, and don’t leave out serving spoons, pitch forks, tongs, a water canteen, and a good eating knife. For leftovers (or cooking popcorn on the fire) take along some aluminum foil. If you don’t want to cook over the bonfire, then bring along a propane grill or camp stove, along with spare propane and other fuel. If your camping trip is a study tour as well, then don’t forget your maps and compass, as well as bird and plant books and catalogues. Bring binoculars – and if you want to see the sky better at night, pack along a telescope. Leave nothing but footprints, and take nothing but pictures in the wild outdoors. And enjoy! You just packed the right camping and survival gear. It’s time to go camping! It’s mid-October, the sun is beaming just right, the morning breeze feels good on your skin and the scenery outside- just breathtaking. So you decided to pack your backs, give your legs a good stretch and trek outside. You wouldn’t let this good weather condition to pass without doing the most logical thing to do on a good day – head outside and go camping! Plenty of food and water – bring about half a galloon per person on a per day basis. You can also bring along water filter just in case you ran out of water and try fresh natural water resources. Extra clothes – bring at least two sets of underwear, pants/ overall, shirt and socks for a day at camp. Camp stove – for cooking or heating water. Emergency/ first-aid kit – keep the basic medical supplies in there, like antiseptics, cottons, sunscreen, bug repellant, bandage, aspirins, pocket tissues and a week supply of any medication you might be on. Fire starter – it’s always more convenient to light a match or click on a lighter than rub two stones to make a fire. Keep the matches in a water proof container or better yet buy water proof matches. Deyhydrated food / canned goods – better known as survival food. No need to cook or heat, bringing everything that needs less preparation is the best stuff to bring on camps. Flashlight – to cope with the dark and to find stuff inside your bag at night. Don’t forget to bring along the batteries. Survival kit – this includes your utility tool, pocket knife, binoculars, military watch, etc. Map/ Compass – even if you know the place where you are exploring, it doesn’t hurt to bring a handy map or compass just in case you’ll get lost. Communication device – GPRS or cell phones can be very helpful and would come in handy during emergencies. Back packs – there is a new camping bag that doubles as a sleeping gear too. You might want to try that! Also try to bring a backpack with more external pockets so you can stuff more things. Tents – when it comes to tents, size always matters. Choose among 2-man, 4-man, 6-man or a 10-man tent for a big family. You would need tarp (rain fly) and a ground cloth to cover the earth. Don’t forget to bring along the tent stakes, support holes and a camp axe to pound them firmly on the ground. The above list is far from being 100 percent complete. But at least we have the basic essentials covered. Camping survival equipments may very and are tailor made to whoever and wherever the camp will be done. For instance, there would be additional things to bring of your child or your pet will tag along. – Always dress light. Be sure to slip on your extra light waterproof boots. Humans can last approximately 2 and half days without water in 49C environment as long as you are not under direct sunlight. – You could even last around 10 days more if ever the temperature is kept at below 21C. Poison Ivy is everywhere. Be sure you would know one if you see one. Poison Ivy’s are three leaf plants usually found on the ground and growing up on trees and rocks. If you get in contact with it, immediately wash off with soap and cool water. – You might think of doing your tents sometime before the nightfall. This should conserve your energy and fluids. In case of a very humid temperature try not do lie directly on the ground. Create a makeshift bed that is slightly raised above the ground so the air could circulate well beneath you. – It’s best to start camp during dusk or dawn to lessen your exposure to sunlight. And finally, have fun, fun, fun! When you’re at camp, make a stronger bond with your family or friends stronger by bonding thru a discussion over bonfire or play card games, board games or even active activities. Camping is the best activity to appreciate Mother Nature. And it is a plus if you get to share it with family and friends. Most find it very interesting that nature is challenging their camping survival skills whenever they go out to trek, it may be in the mountains, woods or down the river. So they just go ahead and look nature straight in the eye and enjoy the splendor of the great outdoor.